Anemia is a condition in which the body does not have enough healthy red blood cells to deliver adequate amounts of oxygen to its cells and tissues. This results in a person becoming weak and tired. 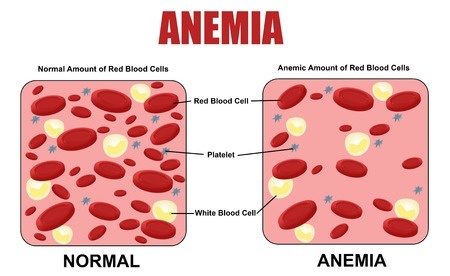 Anemia can result from a number of different causes which may include other chronic medical conditions or microscopic bleeding somewhere in the body. For this reason, it's important to work with your doctor to determine the cause and, ultimately, the treatment. Treatment may include taking supplements or treating the underlying cause. Diet can play a role in preventing anemia. To learn more about anemia, including both conventional and lifestyle medicine approaches to treating it, read the article below.